Follow a champion on and off the court in PBS TV’s AMERICAN MASTERS BILLIE JEAN KING. Photo: Kathy Willens. If you care about the history of women’s sports in America and if you know or remember little or nothing about the key role that tennis champ Billie Jean King played in turning her sport into a professional enterprise, I urge you to check out the latest installment in the PBS American Masters series—Billie Jean King. The documentary, written, directed and produced by London-based filmmaker James Erskine with his producing partner,Victoria Gregory, is a straightforward profile of the tennis champ and social activist from her happy childhood in California to her rise to world tennis prominence and beyond. With a record 20 Wimbledon titles and 39 Grand Slam singles, doubles and mixed doubles wins under her belt, Billie Jean King changed the face of women’s tennis by challenging and rectifying the disparity between men’s and women’s prize money. Her efforts to elevate women’s tennis to professional standing were successfully realized when she helped form the Virginia Slims series, founded the Women’s Sports Foundation and Women’s Sports magazine, and co-founded World TeamTennis. 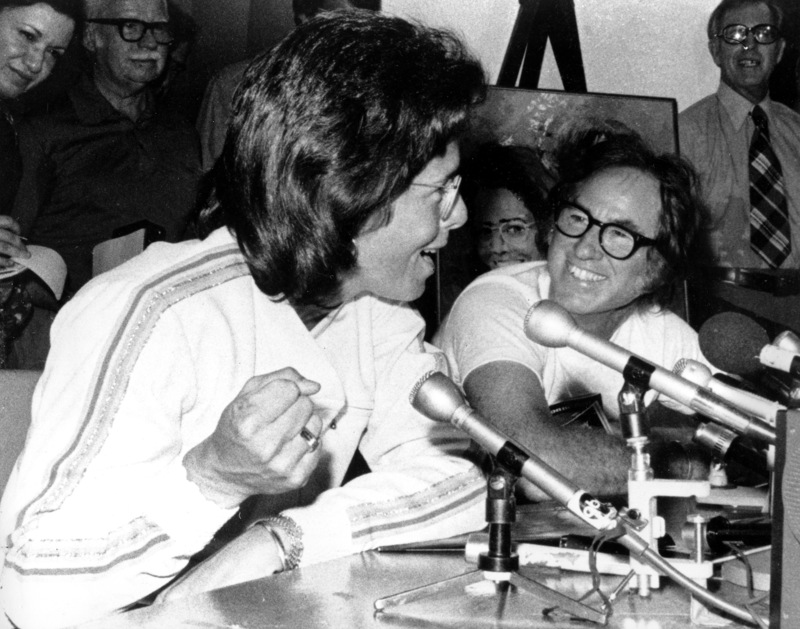 Billie Jean King and Bobby Riggs meet for “The Battle of the Sexes” in September 1973. Photo: AP. 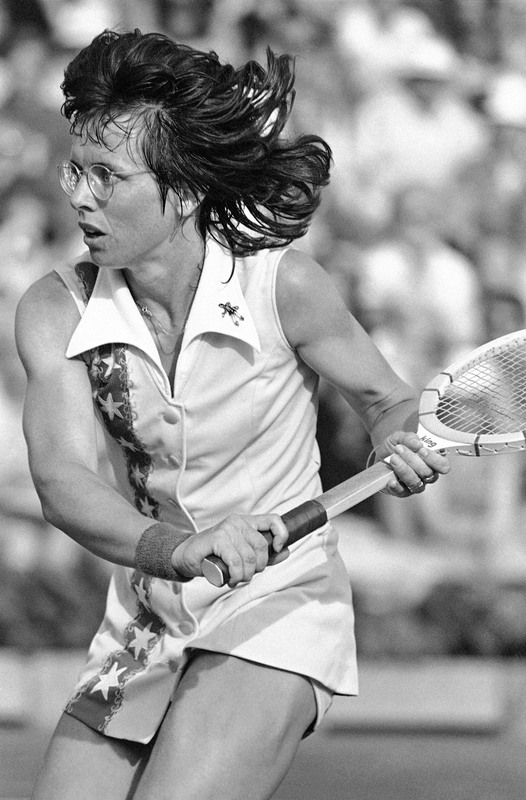 The film gains momentum during its coverage of the period leading up to and including the historic Billie Jean King vs. Bobby Riggs “Battle of the Sexes” match in Houston on September 20, 1973. The media hoopla preceding the match 40 years ago was unprecedented, and Billie Jean’s stunning win changed the face of women’s tennis for players of both sexes and for the American public at-large. As she approaches her 70th birthday in November, Billie Jean, the first female athlete to receive the Presidential Medal of Freedom (2009), is also front and center here as are recollections from a veritable who’s who of women’s tennis stars, past and present, including Margaret Court, Rosie Casals, Chris Evert, Maria Sharapova and Serena and Venus Williams who, no matter what their current age or standing, have benefited from Billie Jean King’s work on behalf of their sport. The most fascinating reflections about the period come from Hillary Rodham Clinton, who as a young woman eagerly followed Billie Jean’s fight for equality during the early days of the feminist movement, and from Sir Elton John, a close friend and colleague in the fight for gay rights and HIV/AIDS awareness. Insights into Billie Jean’s personal life off-the-court are best explored by ex-husband Larry King, who continued to support his wife after she was outed as a lesbian during a media firestorm, and from her devoted, laid-back brother Randy Moffitt, a former pitcher for the San Francisco Giants, Houston Astros and Toronto Blue Jays. This entry was posted in Film, TV and tagged American Masters Billie Jean King, Bobby Riggs, Diversity, Equal Rights, James Erskine, Sports, Tennis, The Battle of the Sexes, Women's Issues. Bookmark the permalink.